Youth Lead Plastic-Free Palengke Drive in La Union | FEED, Inc.
16 March 2018, San Fernando, La Union. Thousands of residents flock the San Fernando Public Market everyday, and each day these buyers take home more than 48,000 single-use plastics. A large portion of this plastic wastes makes its way to residential canals, clogging it and becoming one of the causes of city floods during the rainy seasons. These plastics also makes it way to the streams, rivers, and ultimately the ocean. The Plastic Solution Volunteer, Marc Maravilla teaching his “sukis” the benefits of using a reusable bag instead of single-use plastic bags. The PlastEAric Solution is a movement of repurposing plastic bottles by stuffing the bottles with non-biodegradable wastes such as plastics, straws, cigarette butts, sachets, food wrappers and the like, and reusing them as building materials in communities. In aid of the recently implemented City Ordinance No. 2014-03, that regulates and fines the use of plastic and styrofoam in the San Fernando City, the group of students and Out-of-School Youth from Lupon ng mga Indibidwal na Nangangalaga ng Kalikasan (LINK), college students from the Young EarthSavers Society Bacnotan, volunteers from The Plastic Solution, and La Union Soul, collaborated together to come up with an awareness drive that seeks to document and study single-use plastic usage, and educate market goers on the positive impact of bringing reusable bags. Aptly called Sustainable Palengke, the awareness campaign was implemented on-ground for the first time last March 15, 2018, at the Public Wet Market in San Fernando City, and will continue on social media throughout the year. “There seems to be a gap between the law being implemented, and the people following through. People do not understand why they needed to shift to reusable bags,” says Steven Angelo, President of LINK. Three groups were formed for the eco-awareness campaign. The first group went around to interview and talk with the sellers to educate them about the ordinance. While the other group put up posters around the public market on how plastics are making its way into the sea to fishes and ultimately our plates. Another set of volunteers also documented the number of plastics going out of the market. Another group, took over stalls, and sold produce while educating buyers about why they should use reusable bags instead. The suki volunteers also gave our eco-bags for free to buyers would exchange their plastic bags and put in their purchase in eco-bags. True enough, the effort was welcomed with mixed reactions. While some buyers were close-minded in giving up their single-use plastic bags due to convenience, there were many who were open-minded, and adapted the use of reusable bags. “Some senior buyers refused to give up plastics because they used it at home as garbage bags, or they use it as fuel for burning trash,” Laura, a ski (store) volunteer shares her experience. 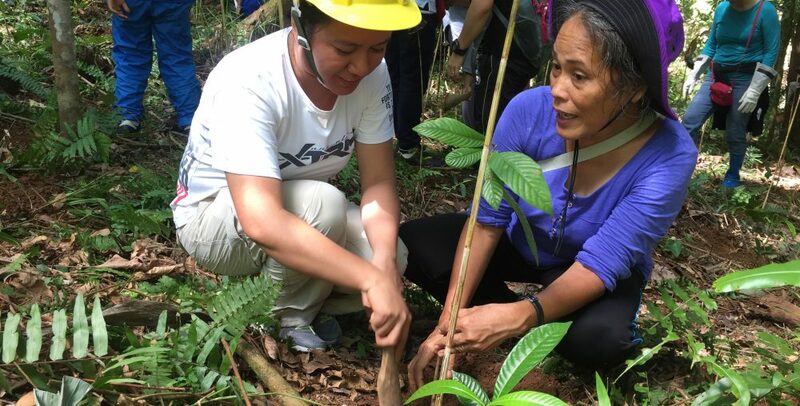 “To change behavior we need to be consistent,” explains Celso Jucutan, a professor in Environmental Development at DMMMSU-Bacnotan, Co-Founder of LINK and the adviser of the Young EarthSavers Society. In the San Fernando Market Alone, it is estimated that minimum of 48,000 single-use plastic bags are taken home by buyers each day. That’s more than 17,280,000 single-use plastic bags every year, in just one Public Market. FEED supports the Sustainable Palengke drive for a #plasticfreefuture for all! Follow Sustainable Palengke on Facebook to learn the latest news, updates, and events on this drive.